Hazel has lung cancer. Thanks to a miraculous treatment, her life has been prolonged for an unknown length of time. She spends her days idly watching America’s Next Top Model and pondering the fate of her beloved parents once she passes. A chance encounter with Gus at a Cancer Group meeting lands Hazel in a whirlwind romance. Although at first reluctant to let Gus into her life, Hazel is eventually persuaded by his persistence and charming nature. They find common ground with their interest in reading, and soon begin reading each other’s favorite book. Hazel’s favorite book is An Imperial Affliction, about a young girl battling cancer. Hazel is obsessed with finding out how the book ends for all the characters, and with the help of Gus, she is given the opportunity to meet with the author. Hazel soon discovers, however, that life does not always yield clear cut answers, and an unexpected tragedy makes her reevaluate her own life. John Green has taken a very valiant stab at attacking teen “sick lit.” He is very good about keeping the focus on the characters, not their illness. Oftentimes it seems that books define sick characters by their illness, almost as if that person becomes their illness. Green moves away from that by creating witty, humorous characters that develop a very strong bond over common interests such as reading. At times the dialogue seems pretentious and advanced for teen audiences, but one must remember that both of the teen characters are avid readers with a lot of time on their hands. Their close encounters with death have made them very philosophical and introspective, and this is demonstrated throughout the book. Illness is not at all pretty, and Green does a good job of capturing the ups and downs of cancer treatment, recovery, and relapse. Despite its rather tragic ending, the reader is not groomed to expect a happily ever after and the book’s conclusion seems both appropriate and satisfying. Reader’s Annotation: Imagine meeting your soulmate at the end of your life. For star-crossed lovers Hazel and Gus, this is their reality. According the author’s website, “John Green is the New York Times bestselling author of Looking for Alaska, An Abundance of Katherines, Paper Towns, and The Fault in Our Stars. He is also the coauthor, with David Levithan, of Will Grayson, Will Grayson. He was 2006 recipient of the Michael L. Printz Award, a 2009 Edgar Award winner, and has twice been a finalist for the Los Angeles Times Book Prize. Green’s books have been published in more than a dozen languages. Read excerpt of Hazel telling Gus that she is a grenade. 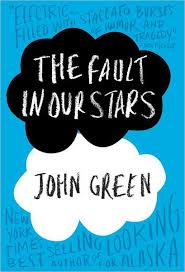 Discuss what it means to have fault in your stars.